The news may lead you to believe that almost everything is manufactured in China, and that what little is left is made in Mexico, India, or Brazil. The numbers about the world economy, however, tell a different story. Most of the manufacturing in the world still takes place in advanced economies, where labor is expensive and where manufacturing employs a diminishing share of the labor force. The Curious Cat Economics blog contains several enlightening charts about the state of manufacturing in the world. 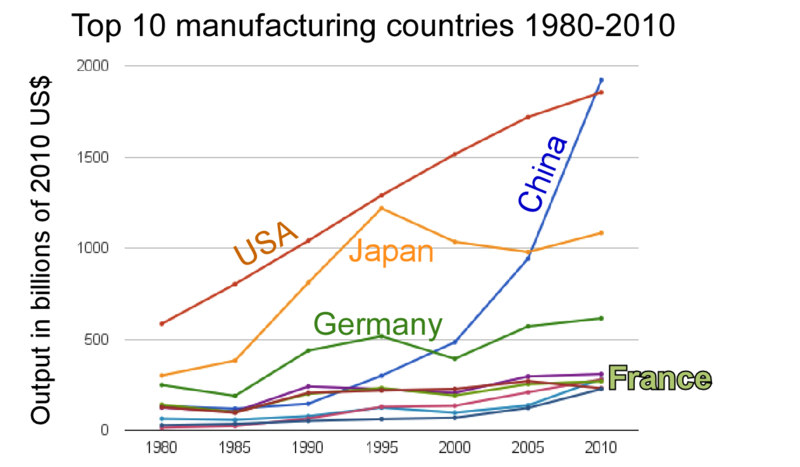 Figure 1, for example, reveals that, as of 2010, three of the four largest manufacturing economies — the US, Japan and Germany — were high-wage countries, with China as the lone exception. Out of this Value Added, companies have to pay for people, facilities and equipment, and taxes. This metric has the merit of being widely available, in part because it is used as the basis for a tax in many countries. It is meaningful, but not a perfect measure of activity, and much confusion is created by the many uses of the term “value added” to mean other things. 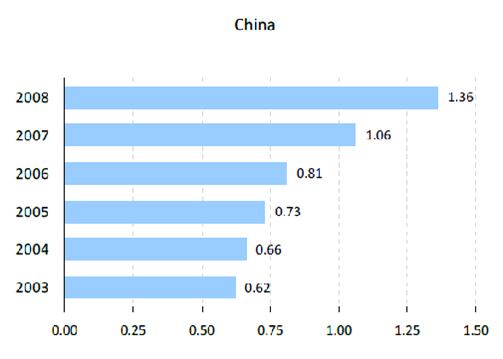 Using data from the US Bureau of Labor Statistics (BLS), Figure 2 shows how these countries rank in terms of labor costs, with the special case of China shown in Figure 3. Labor costs in Figure 3 include both wages and benefits; they are total costs to the employers. The only cheap labor country among the top four is China, and it is not shown in Figure 2 because the BLS does not have data on China past 2008. Figure 3, however, shows wages in China rising rapidly, and they have continued to do so since 2008. 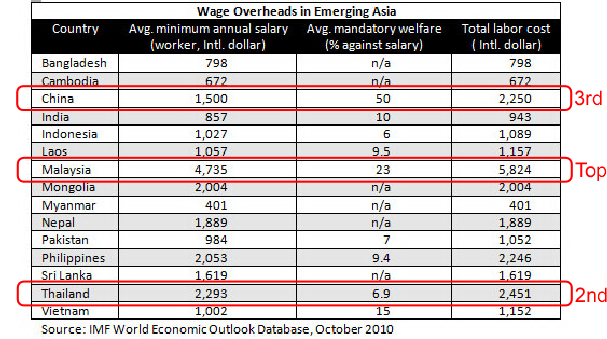 According to The Economist’s Intelligence Unit, average labor costs in China in 2010 were $1.84/hr. 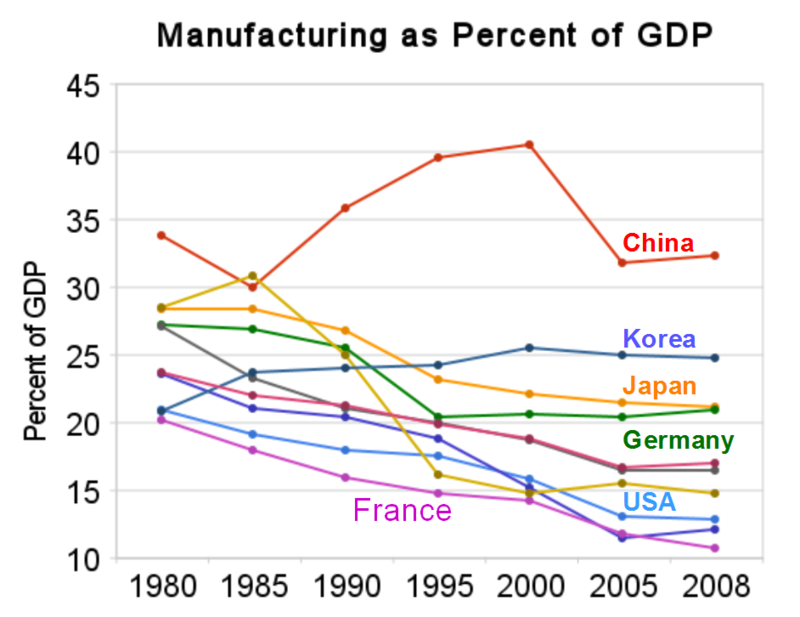 Furthermore, as you can see in Figure 4, also from the Curious Cat Economics blog, manufacturing’s share of the GDP is holding steady in the USA, Japan, and Germany. Manufacturing remains a major component of the advanced economies, but this is compatible with a decline in manufacturing employment. As China built the largest manufacturing sector in the world up from nothing in 35 years, some activity has clearly migrated there from Europe, the US, Canada, and Japan, but the shift is nowhere near as massive as it is perceived to be. What has created this perception is that, in the G7 countries, manufacturing employment has decreased much more than manufacturing’s share of GDP. The high labor costs are coupled with high productivity, and it takes fewer people to produce the same value added. In the US, manufacturing dropped from a high of 40% of the labor force in 1960 to about 11% today. In Japan, Nippon Steel’s Yawata Steel Works in Kitakyushu produces as much steel today as it did 45 years ago, with a work force that has gone from about 40,000 in the 1960s to 3,000 today. An auto parts plant in China will be swarming with people; its counterpart in Japan will have one operator taking care of 20 machines. To take a closer look, I retrieved the data in Figure 5 from a variety of sources. All the numbers about GDP are from the World Bank; most labor costs, from the US Bureau of Labor Statistics (BLS). The grand total is $2 trillion short of the total world GDP for 2011 due to the exclusion of countries that don’t provide data on Manufacturing. The labor costs for China and India respectively come from the British magazine The Economist and from an Indian e-zine. Although these numbers are from respected sources, we should not forget that the quality of economic statistics, while nowhere perfect, is much better in rich democracies than in poor or authoritarian regimes. The collection of complete, accurate data sets is expensive, and you need a free press to keep rulers from manipulating this sensitive data, in particular growth rates. China is at the top of this ranking, but followed closely by the US and mostly other members of the G7 group. The remaining countries in the table are leading emerging economies often referred to as “BRIC” for Brazil, Russia, India, and China. 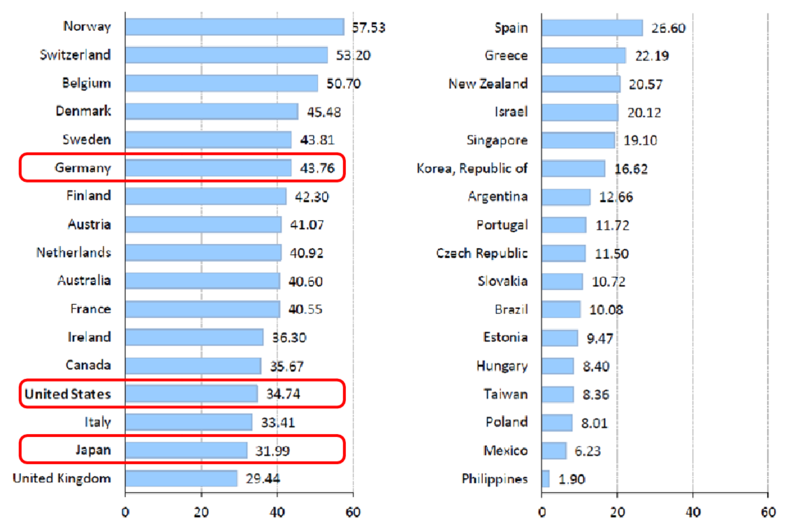 Figure 6 summarizes the manufacturing GDP data in Figure 5 by country group. The BRIC countries together represent 2.7 billion people; the G7, about 725 million. The BRIC country labor costs range from $1.71/hr in India to $10/hr in Brazil; the G7, from $29/hr in the UK to $43/hr in Germany. Yet the BRIC countries account for substantially less of the world’s manufacturing GDP than the G7, and, among the BRIC, China by itself accounts for two thirds. The industrial revolution in Europe and the US was not an event like the American and French revolutions but instead a development that took more than a century to unfold. The emerging economies of today do not have this leisure. They need to catch-up in a few decades. The first one to do it successfully was Japan, starting in the 1860s with the Meiji era. Late 20th century success stories include South-Korea, Taiwan, Hong Kong, Singapore, Malaysia, and finally China. These countries all followed different paths, but share the characteristic that they relied on cheap labor to get started and that, as their manufacturing sectors matured, their labor costs rose and ceased to be the primary motivation for locating factories on their soil. The challenges facing manufacturing companies in every country evolve over time. During the cheap labor phase, they are handicapped by the work force’s lack of skills, which is usually compounded by a rickety infrastructure of transportation, energy and communications, the lack of local suppliers for materials and services, and a weak legal system. For foreign companies, you also have the additional challenge of training and managing a new work force in a different language, possibly across many time zones, and of shipping the output to the target market. Labor remains cheap only if the country fails to develop as hoped, in which case, the above-mentioned challenges persist. If the country succeeds, they are resolved, but labor is no longer cheap, and manufacturers there must compete both with cheaper labor counterparts in newer economies and with expensive labor in older ones. Vietnam’s labor today costs one third of China’s while China’s is one fifth of Russia’s. Systematically searching for the cheapest labor implies walking away every few years from investments, not only in plant and equipment but in the development of a skilled workforce, an organization adapted both to a local culture and to the corporate culture of a multinational, and a local supply chain. It can only pay in industries where none of these issues matter. In most industries, building a factory is a commitment to the area, region, and country for decades, and you make that decision for a variety of reasons, labor cost being only one of many factors. You may believe in the country’s potential as a market for your goods, want a hedge against exchange rate fluctuations, and defuse protectionist tendencies. In the car industry, this is why Toyota built plants in the US and Volkswagen in China. Lean has sufficiently increased productivity. Not only are people used effectively but the level of automation is high, as is the case with products ranging from cars to detergents. The products have a high value added, like luxury watches from Switzerland. There is a high technological barrier to entry in the industry. The products are customized, which makes geographical proximity to customers an advantage. No advantage, however, lasts forever. Labor costs go up, and technological barriers fall. The German camera industry was a leader until the late 1960s, with brands like Rollei, Leitz, Zeiss, or Edixa. It was relying on the knowledge accumulated by generations of engineers over a century in optics calculations. By the late 1960s, however, computers were powerful enough for Japanese competitors like Nikon, Canon, or Minolta to replicate these calculations with software and take over the market. 40 years later, German cameras are collectibles but the German optics industry has not disappeared. It has shifted to high-end professional equipment for such applications as photolithography, and is still present in such mass-markets as eyeglass lenses. Unless you are at the bottom or at the top of the scale, you always have competitors with lower wages and with higher wages. The US is a low-wage competitor to Denmark but a high-wage competitor to Mexico, which itself is a high-wage competitor to China. Now Vietnam is emerging as a low-wage competitor to China. Against high-wages you compete on price; against low-wages, through superior quality and higher productivity. In countries that develop successfully, wages rise and competing through cheap labor is only a temporary opportunity. In recent years, Chinese wages have been rising at a rate in excess of 13%. At this rate, in 9 years, wages in the Pearl River Delta will be $12/hour, or higher than in Korea in 2003. The decision to contract out the manufacturing of a toy for the next Christmas season can be based on current wages, but the decision to build a car assembly plant should not be, because it will remain in operation for decades, and the decision makers must anticipate what wages and the work force will be 10 or 15 years ahead.